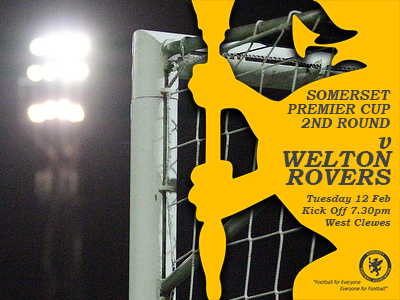 A Romans side will head back to West Clewes for a Somerset Premier Cup Second Round fixture against Welton Rovers. Kick off – 7:30pm! City won the original fixture by three goals to one back in November but were then found guilty of fielding a suspended player in the game. Statement (Jan 23rd 2019) – Following our 3-1 win against Welton Rovers in the Somerset Premier Cup 2nd Round in November, we have been found guilty of playing a suspended player in that match. We were aware of the suspension and had, a week before the tie, checked with the Somerset FA if the suspension applied to the match and had understood that it didn’t. Upon being charged with the offence a personal hearing was requested and, at a Cups Committee hearing held last week, it was ordered that the result of the match be declared null and void and the tie to be replayed. The winner of the tie on Tuesday evening will travel to Taunton Town in the Quarter Finals. Safe journey to all City fans travelling to West Clewes! Admission: £6 Adults, £4 Conc & Children get in FREE.